With more than 150 enquiries and €120,000 of orders in the first three days, Industrie Lyon has undoubtedly been a successful show for NIKKEN. This activity is a reflection of the general upturn and optimism in the engineering and manufacturing sectors that we are experiencing right across Europe. 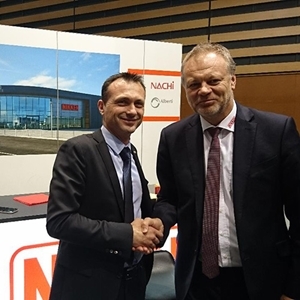 Pictured (left) is Xavier Nicod, Procomo NIKKEN local Sales Manager being congratulated by NIKKEN Europe CEO & President, Tony Bowkett, on selling a large tooling package to a customer at the show on Thursday 6 April.